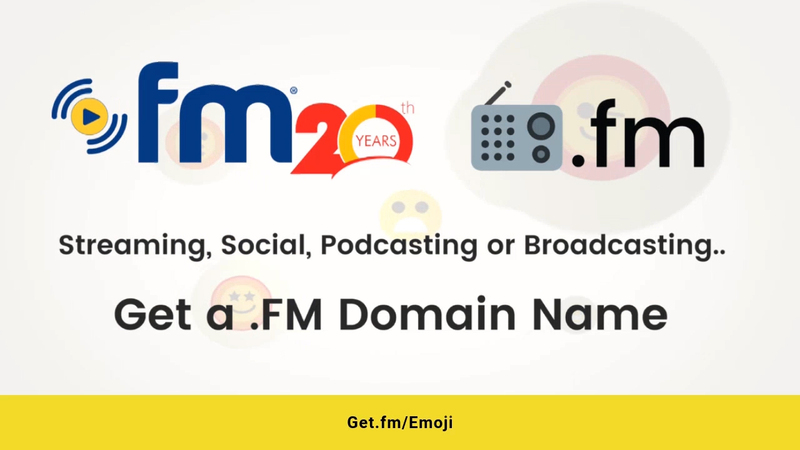 SAN FRANCISCO--(BUSINESS WIRE)--BRS Media, a diverse and growing media e-commerce firm that assists traditional and interactive media companies build and brand on the power of the Internet, today announced that dotFM, the .FM Top-Level Domain Registry, has officially launched Emoji based Domain Names. Emoji domain is a domain name with an expressive digital image or icon in it. Some of the world's most innovative .FM brands include; Overcast.fm, Southwest.fm, CarrieUnderwood.fm, DI.fm, Anchor.fm, Last.fm, Skyrock.fm, Earbud.fm, Rainmaker.fm, Jazz.fm, Panoply.fm, Coca-Cola.fm, Summertime.fm, among thousands more. Based in the South of Market district (SoMa) of San Francisco CA, BRS Media (https://brsmedia.fm) was established in 1995, and is celebrating over 20 years Online, featured as one of the fastest growing privately held companies by the SF Business Times and Inc. Magazine for five consecutive years. Its portfolio of leading online properties includes: dotFM® & dotAM®, spotlighting Domain Innovation and Brand Registry Services for media based .FM and .AM domains; dotRadio™ extensions .RADIO.am & .RADIO.fm, Radio's only truly Open & Innovative Domain Extensions and @RADIO.am & @RADIO.fm, Premium Web-based Email Services. dotRadio is a trademark; and dotFM and dotAM are registered trademarks of BRS Media, Inc.